Simple, casual and elegant, the Aurora bench is one of Greenington’s most modern, clean lined designs, to perfectly accent any home. 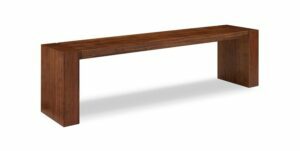 The Aurora collection offers a selection of two bench sizes to suit both large and smaller spaces; choose from 64″ or 48″ long. Inspired by Scandinavian modernism, the simple lines of the Currant long and short benches bring the simple elegance of Mid-Century design into the modern home. A comfortable complement to just about any room, the Currant bench is beautifully finished on all four sides. The Currant’s smooth solid bamboo seat and softly rounded corners show off the beautiful color and grain of the bamboo material, complemented by the detailed legs, which elegantly taper towards the floor. The Hazel Long and Short Benches. Available in two lengths the Hazel short bench measures 48″ long, 14 1/2″ deep and 17 1/2″ high, while the longer version is 64′ long. Simple, casual and elegant, the Hazel is one of Greenington’s most modern, clean lined designs, to perfectly accent any home. The Hazel Dining Collection includes two dining tables to suit both large families and intimate dining; choose from 72″ x 36″ x 30″ or 84″ x 42″ x 30″. Combine either table with the matching dining chairs, bench seating and sideboard, all in our updated rich nutmeg finish. The Hazel Dining Collection makes it easy for you to promote sustainability in a lovely, classic and functional way in your home. Greenington’s most popular and super comfortable Tulip stool is now a beautiful bench. Ergonomically designed for comfort, the smooth curved bamboo seat showcases the beautiful bamboo grain. A comfortable complement for just about any room, the Tulip bench is available in your choice of caramelized or rich Dark Chocolate finish. Crafted in 100% solid Moso bamboo, the Tulip bench makes it easy for you to promote sustainability in a lovely, classic and functional way in your home.